This is an easy meal to throw together with anything you may have in your fridge. 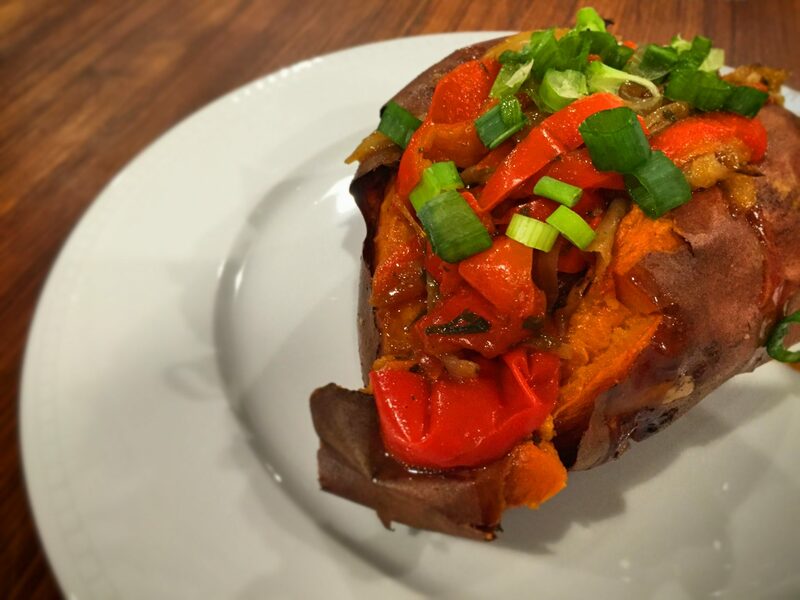 All you NEED is a sweet potato! Wash the potatoes and poke holes in them with a fork or knife. Place on a baking sheet that is lined with parchment paper. Pour a couple of drops of olive oil on the potatoes. Turn a few times so that the skin has a thin layer of olive oil. Bake sweet potatoes on 400 for 60-75 minutes. You want the potato to be soft on the inside and begin to caramelize. In a pan, sauté the garlic and onions in the olive oil for 10 minutes. Throw in the peppers, parsley, cumin, chili powder and salt. Cook covered on medium for 15 minutes. When the potatoes are done baking, slice down the middle just enough to stuff them but not separate into halves. Stuff the potatoes with the filling.